When I saw this wine in the store I was a little confused. It said the name of the wine but then “by Cono Sur” at the bottom of the label. I decided not to get it the first time around because we had a few wines already queued up for future WineAndCheeseFriday pairings. I contacted Cono Sur on Twitter to ask about this mysterious line of wines since I couldn’t find it on their website. As always they were very helpful and said was it called “Tocornal?” Yes, that’s one of ours, but its only distributed in Canada, Latin America and Russia. Well this created a buzz on Twitter and for me so I figured I should go back and find it. A week later in another grocery store, there it was and, lucky us, they had a Carmenere! 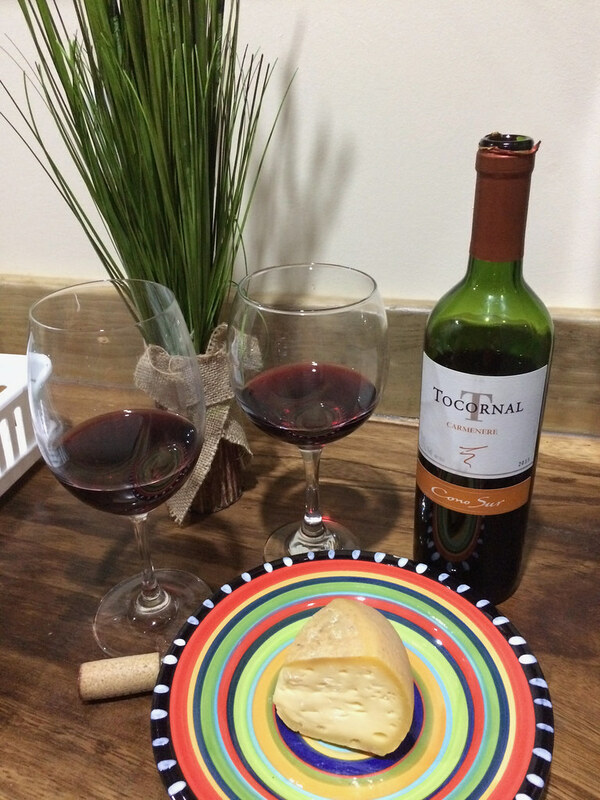 What a fun chance to compare the Bicicleta Carmenere from a few years ago, http://wineandcheesefriday.com/carmenere-and-camembert/, to the Tocornal Carmenere now. 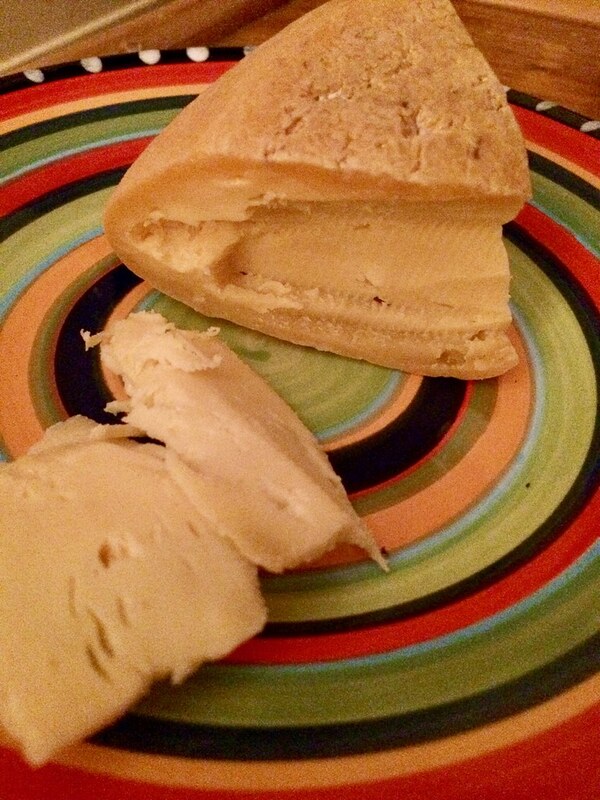 The cheese is from our giant farmer’s market, La Feria. We found this cheese in Colibri’s Corner, the booth on the end. This booth always has all sorts of tasty treats like spices, baked goods and chocolate. Neil picked up this wedge of cheese and said it smelled kind of smoky and that we should get it. Always on a quest for new cheese, I happily agreed. ConoSur has a #winechat on Twitter and after first trying their wine in Ecuador, we became fans. I’ve attended a few of their wine chats and happily praise their wines that I’ve tried. Knowing that they are a Latin American brand, I wondered if I’d find any of their wines here in Costa Rica. Sadly it was kind of hard, a Sauvignon Blanc here or there but never the Pinot Noirs I know them for. When we first found the Tocornol it was the Merlot and I was looking for a Carmenere to take part in their upcoming chat. When I went home and found out I had already tried the Bicicleta Carmenere I happily laughed it off. 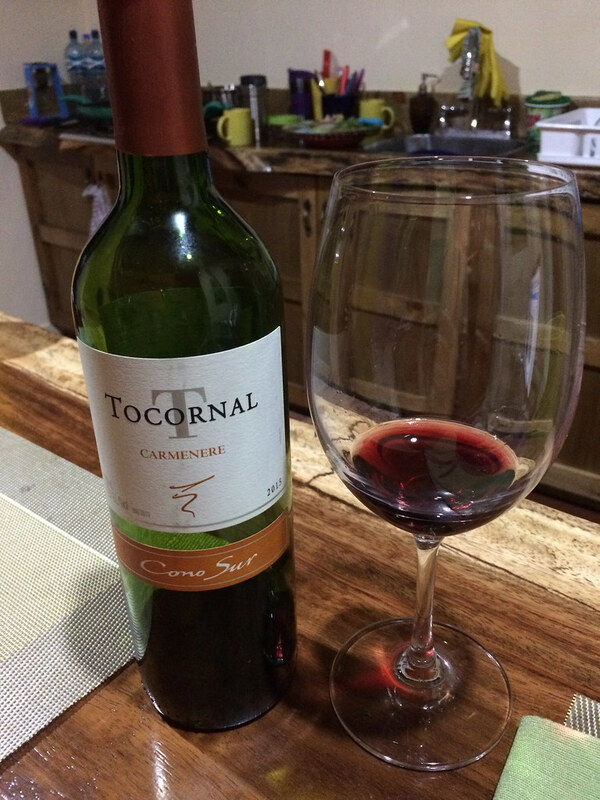 Then when I found the Tocornal Carmenere in another store I was pleasantly surprised. That store actually had the Sauvignon Blanc and the Bicicleta Carmenere too. I’ll have to remember that store carries Cono Sur for our next trip here. So what about that cheese that smelled a little smoky? Once we were home and officially trying it, there were aromas that were stinky, funky, salty and maybe vinegar. Neil smelled grass and thought it was pungent. When I tasted the cheese, it was smoked, tart, soft, pretty funky and it tingled my tongue a little. Then I noticed the flavor of green beans. The cheese kind of dried out my mouth. Neil picked up tangy milk flavors and a light salt. He described it as a light Emmentaler. When we looked at the cheese there was a noticeable rind which seemed out of the ordinary for Swiss cheese. I tasted the rind just to see if it had a flavor and it tasted sort of like mustard. Neil said the cheese was pretty good but there was still a spongy texture. I thought it was pretty interesting. We were definitely surprised there was a Swiss cheese in Costa Rica. I contacted the lady from La Feria by email to see if she had any information about this local cheese. She told me it is from the Canaan Cheese Factory that is near the Chirripo Volcano. In preparation to write this entry, I searched for the cheese factory online and found out their story. I wish I had read this before leaving Costa Rica! I’ll just have to save the info and make a plan to go visit next time we are here. Both of the wine and cheese have such fun stories. We’d better pair them to see how they work together. I found the wine to smell the same but the flavor got lighter. Then I noticed the berry flavor increased. The cheese became milder but maybe more gritty. When I tried the wine again it smelled more floral and herbal. The wine and cheese were definitely influencing each other. Neil thought the wine mellowed really nicely with more fruit flavor, more spice and less smoke. He said it was a nice blend of the three flavors. The cheese became more tart but was good. It seemed to get a creamier texture. The flavors of wine and cheese kept changing. After the pairing I noticed a finish of spinach or Brussels sprouts, some type of strong green vegetable. We both liked this pairing for different reasons. What an interesting wine and cheese both separately and together! Only one wine and cheese left to discuss as part of our Costa Rican series. Visit us again soon to see where we are tasting WineAndCheese next!